The sniffer at the cafe last month. The following is the original of an article that appeared in the News Lens. If there’s a more accomplished flâneur in Taipei than my old pal Bede, I have yet to meet the person. Anchoring his perambulations around convenience-store pit stops, he literally stumbles upon scenes and characters that most Taipei natives would scarcely credit. As with several revelations concerning the seedier aspects of the city’s underbelly, it was Bede who first alerted me to the issue of solvent abuse in Taipei. He was right. 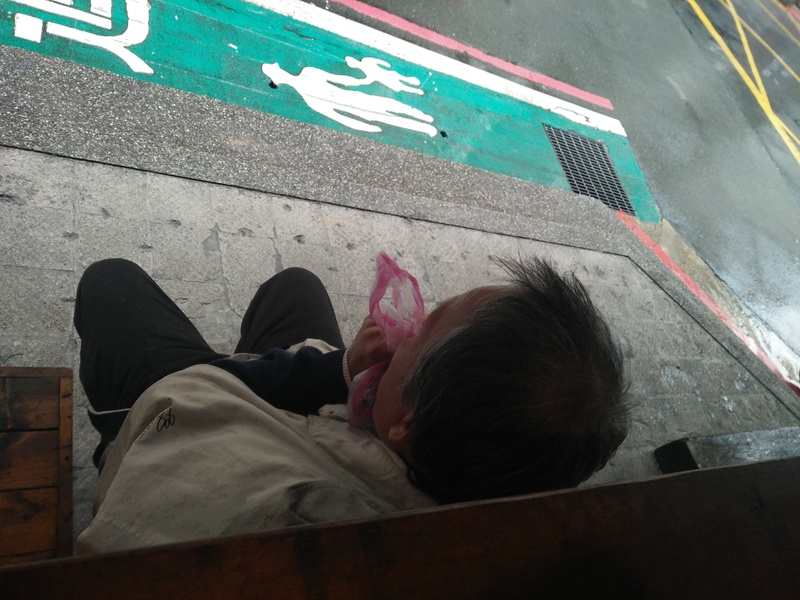 Over the past few years, I have seen glue sniffers all over Taipei – alongside fetid canals in the suburbs of the city, under the crisscrossing flyovers that connect heaving expressways, outside office towers in crowded downtown districts. 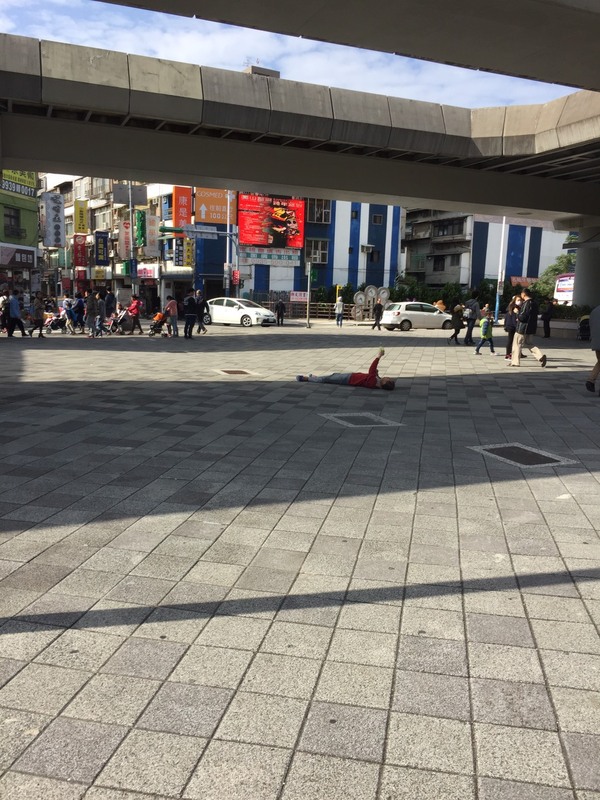 A couple of months ago, as I was working at a café close to Taipei Arena (台北巨蛋), a man approached and plonked himself on the smokers’ bench beneath the open window where I sat. As he pulled a small pink carrier bag – the type favored by fruit market vendors – from his mottled windbreaker and pressed it to his face, I could have reached down and stroked his salt-and-pepper hair. The strong smell of the glue wafted up from the open bag as he inhaled. A little sigh signaled he was done, at which point he stood up and turned around, coming face to face with me. Although he seemed to stare at me for a good couple of seconds, it was hard to detect any sign of sentience in his dull gaze. He grunted a monosyllabic assent, not to me but some imaginary interlocutor, and shambled off. Several office workers stood waiting for their coffee to-go, but neither they nor the staff, who were eye-level with him and just a few feet away, noticed. Last weekend, in the backstreets near the Taipei Expo Park (花博公園) in Yuanshan (圓山) I came across another glue sniffer. This one was stalking up and down a narrow stretch of pavement that runs alongside a high school wall, alternating between a series of benches as he huffed, tearing out clumps of leaves from the hedges and scattering them as part of some unfathomable ritual. It’s not, though. Not in the real sense of the word. Because most people are completely unaware that this is even an issue. I know this because I have seen flagrant sniffers in the middle of busy thoroughfares, their heads buried in larger carrier bags as oblivious hordes jostled around them. Also, as the death knell on a half-hearted career in pedagogy tinkles out, and I attempt to complete the transition to full freelance, I have increasingly been using students as a sounding board for stories on social issues. Of the 100-plus people I have asked, only a handful were cognizant of the existence of solvent abuse in Taiwan. A couple said they remembered seeing people engaging in it. Both of them are middle-aged and were recalling incidents from many years ago. Many did not even know this was a thing. A fair few shook their heads and said I must be mistaken. Outside the classroom, several friends and family members I asked had seen or knew about it, particularly those who had grown up in small towns or underprivileged areas. But most viewed it as uncommon and an anachronism. Interestingly, most foreign residents, including many long-termers, are surprised to hear this goes on in Taiwan. For people, such as myself, who grew up in environments where serious drug abuse was common, this island is often viewed as a blissfully innocent vacuum. Drug use is not altogether rare, but the lack of public understanding about it indicates that it has not pervaded society in the way it has the Western world. Still, if you know what you’re smelling for and your olfactory senses have not been completely knackered by the pungent odors that assail the nostrils, you will often pick up the toxic scent of ketamine in Taipei. The quick burn, saggy paper and unusually long ash of the cigarette are other tell-tale signs. I have been in elevators where I could smell it on the user’s clothes. Yet, most people could be standing right next to someone who is pumping out these fumes like a chemical factory chimney and be utterly clueless. 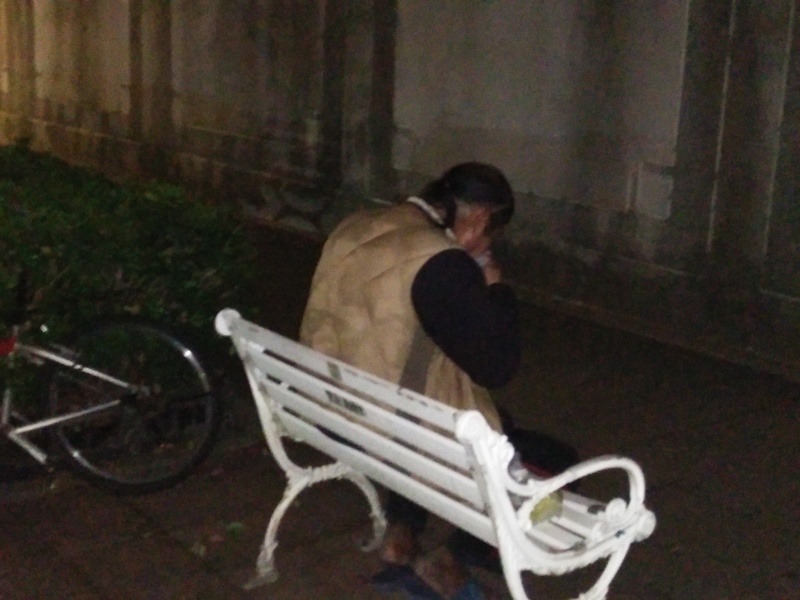 This fellow, whom I spotted close to Yuanshan station the weekend before last, paced up and down the pavement, swapping benches every few seconds and tearing out clumps of leaves from the bushes. That said, at least the average person has heard about ketamine and amphetamine abuse. Not so glue, which is perfectly legal and easily available from any hardware store. Even those who have documented cases of solvent abuse in Taipei now seem out of touch with the extent to which it continues to be a problem. “You seem to know more than me,” admits Dr. Tsai Shih-jen (蔡世仁), head of the psychiatry department of Taipei Veterans Hospital (臺北榮民總醫院 ) who has treated and written about solvent abuse patients. We’re in his office, close to the entrance to the popular Junjian rock hiking trail (軍艦岩親山步道) in the foothills of Yangmingshan National Park (陽明山國家公園). In the years that I have lived in and cycled around the mountains of Beitou (北投) and neighboring Danshui (淡水) in New Taipei City (新北市), I have noticed that quite a few psychiatric units are located in scenic mountain areas. Is that deliberate? “Perhaps,” says Tsai, smiling softly. In 2003, he published a paper on the long-term psychiatric effects of glue-sniffing. The research comprises a re-evaluation of patients who were admitted to the ward between 1984 and 1996. The patients were all males ranging from 26 to 37 years of age. Each of them began sniffing as adolescents, the youngest having his first experience at 12 years old. Most of the patients were of extremely low intelligence, with one recording an IQ of 73, which is borderline intellectual disability in psychiatric terms. In general, says Tsai, these people were from underprivileged backgrounds and of low intelligence. The paper indicates that the solvent abuse may have contributed to impairment of intelligence, though Tsai admits it is hard to know whether this was chicken or egg. Several suffered from delusions and hallucinations, paranoia and persecution complexes being common. One self-harmed and one attempted suicide in response to voice command hallucinations. In the most troubling case, a patient attacked a stranger in the street with a hammer. This claim that solvent abuse is particularly common among the youth is unsurprising as data on solvent abuse or inhalant abuse in general from around the world shows a clear skew toward young people. However, the men I observe using glue around Taipei are all in their 40s and 50s. This makes sense. Tsai’s surprise at my observations about the prevalence of sniffing is based on his belief that there are far fewer abusers than there were in the 1980s and 1990s. “I used to see quite a lot of patients for this issue, but in the last few years just one a year, maybe,” he says. Yet, while it may well be true that there has been a steady decline in overall use, the numbers are far from negligible. Most surprising to me is Tsai’s assertion that glue sniffing is “not such a serious problem.” Granted, he is comparing solvent abuse to the increase in and dangers of ketamine and, in particular, methamphetamine use in recent years. He is also at pains to stress that he is a psychiatrist and, while he believes long-term abuse can lead to impaired cognitive function and psychosis, he is not qualified to say whether it can have a serious impact on other aspects of a user’s physical health. Nevertheless, when he goes on to compare glue-sniffing to “Western use of marijuana,” in terms of the dangers and the short-term nature of the mind-altering effect, I am astounded. Personal experience and observation, I assure him, make me certain that they are not even remotely comparable. He smiles gently and once again defers to my “knowledge” of such matters. Besides my anecdotal evidence, there is plenty of scientific support to suggest that chronic glue-sniffing is seriously dangerous. Severe neurological and renal effects have been recorded in a study by Chang Gung Memorial Hospital (長庚紀念醫院), which also links solvent abuse to muscular disorders stemming from a depletion of potassium. Case studies by the Tri-Service General Hospital (三軍總醫院) go a step further positing life-threatening, albeit reversible, paralysis. Watching the confused, erratic and occasionally aggressive behavior of glue sniffers in Taipei, I do wonder what can be done for these people. Tsai tells me that the Taipei City Psychiatric Center at the Songde (松德) branch of Taipei City Hospital (台北立聯合醫院) also treats solvent abuse cases, but admits that there aren’t many options for dealing with long-term users who have no inclination or, in many cases, are too far gone to seek treatment. If, as I suspect, the glue sniffers I see on streets of Taipei are the remnants of a previous generation, the only way to tackle the problem is to ensure they cannot get their hands on solvents. Glues that contain toluene, the intoxicating agent, are available almost anywhere, including convenience stores. In many U.S. states, there are regulations regarding the sale of products containing toluene, especially to minors and in cases where it appears obvious that the product is likely to be used for recreational purposes. Back in the 1980s, when solvent abuse was a big problem in the U.K., shopkeepers were prosecuted for selling glue to kids who were known to be sniffing. The glue sniffers I have come across are unlikely to pass for hardware enthusiasts. A lack of public awareness notwithstanding, it should not be too hard for store owners to make an assessment of who is likely to be abusing these products. With a coordinated effort by the police and local authorities, an effort could be made to restrict access to toxic solvents. A dedicated rehab program would also need to be established. It’s either that or just allow these men to literally die a slow, deranged death on the street as Taipei’s citizens walk by. I have seen “solvent sniffing” kids in the streets of Manila in the Philippines. They have it in a clear plastic, they’re out in the open. It’s obvious that these kids don’t have homes, they’re not going to school. Biggest factor that lead them to sniffing solvent is poverty and lack of education. I am just not sure what the Philippine government is doing now with issue. I agree, a coordinated effort by the police and local authorities and an extra effort could be made to restrict access to toxic solvents in Taiwan and other countries with same cases.